I just got some great inspiration from this video I watched on YouTube from Wallstrip. It is entirely possible to record and produce an entire video blog from within an Apple store. This might be a great way to demo the iPhone without actually buying one. I think I might do this once I get to Seattle on July 11th. But, if someone wants to start before then, please do, and at least give me credit for the idea by linking to this blog post. So, I finally figured out how to do ctrl-alt-del in Windows on my MacBook using Apple’s Boot Camp. You have to hold down the fn key as well. So…. fn+ctrl+alt+delete. Hope that helps some people out. Recently (through Amazon.com no doubt) I bought a SpaceNavigator which is an inexpensive 3d mouse. A regular mouse only allows you to move around in two dimensions. Left and right, up and down. 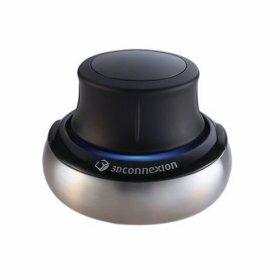 This 3d mouse allows you to go left, right, up, down, rotate clockwise and counterclockwise, zoom and zoom out, and tilt up, down, left, and right. The SpaceNavigator works with both Google Earth and SketchUp, so I had to play around with both of them. In Google Earth, you don’t even need to use your regular mouse to explore every nook and cranny of planet earth. It’s even cooler with the 3d buildings turned on because you can zoom down in between buildings and pretend you are spiderman flying over a street by jumping from building to building high above the ground. With SketchUp, the 3d mouse comes in really handy for moving the camera around the 3d object that you are editing. In order to get my hands wet with 3d modeling in SketchUp, I started out trying to model the Duderstadt Center at the University of Michigan. This is a huge building on North Campus. There was already a 3d model of the Duderstadt Center done as part of the 3d Atlas of Ann Arbor, but it was just the outline of the building in 2d raised the height of the building and images placed around the outside. I wanted to add a lot more detail. It was rather difficult at first to get all of the shapes of the building the way I wanted them. I gave up to try something simpler. So, I moved on to The Cube. I used SketchUp to model the cube in 3d, and geo-referenced it so that you can view it in Google Earth. I’ve added a recent changes feature to Cartiki, which means you can see when new locations are created and when other stuff in the database changes. You can also subscribe to this feed via RSS so that you don’t have to keep checking the site. You are currently browsing the Kyle Mulka's Blog blog archives for June, 2007.